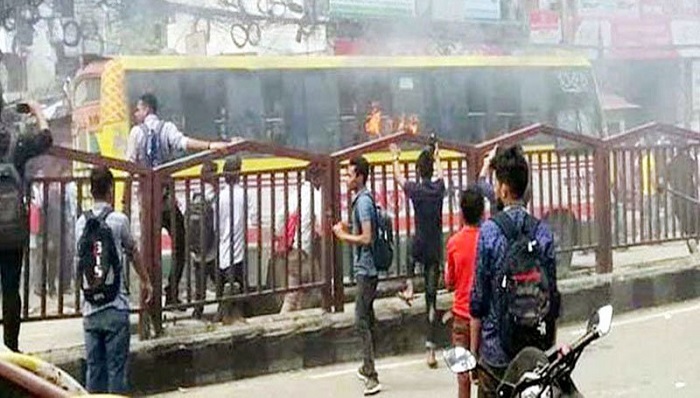 The Bangladesh Road Transport Authority or BRTA has revoked the registration of a bus operated by Suprobhat Paribahan responsible for the death of a university student in the capital on Tuesday morning. Following a daylong student protests BRTA took the decision of temporary cancelation of the registration of the bus, road transport authority said in a letter. The BRTA blamed reckless speed for the death of Abrar Ahmed Chowdhury, a student of the Bangladesh University of Professionals or BUP, at Nadda early in the morning. Their demands include maximum penalty for the bus driver within 10 days, revocation of Suprobhat Paribahan’s license to operate, installation of a bus stand, a government order requiring drivers to display their photograph and license inside the bus, the installation of a footbridge at the Bashundhara gate and CCTV cameras to monitor traffic officers’ activities.